DAPA - Haematologic Technologies, Inc. The structure of dansylarginine N-(3-ethyl-1,5-pentanediyl)amide (DAPA) is illustrated. DAPA is a potent inhibitor of thrombin which exhibits unique changes in its fluorescent properties when bound to thrombin. 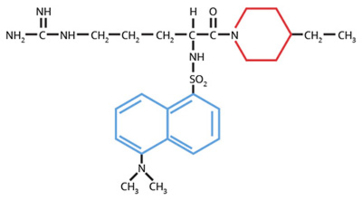 Dansylarginine N-(3-ethyl-1,5-pentanediyl)amide, more commonly referred to as DAPA, is a potent (Ki=10-7M) and specific synthetic thrombin inhibitor (1). Of special interest are the unique fluorescent properties contributed by the dansyl moiety of DAPA. When bound to thrombin, the fluorescence intensity and lifetime of the dansyl moiety are increased three fold. The enhancement of fluorescence intensity, coupled with its inhibitory properties, have made this compound extremely useful for studies involving thrombin generation (2-7). In addition to an increase in fluorescence intensity and lifetime, there is a decrease in depolarization of the excitation signal which also supports fluorescence polarization studies. The inhibitor properties of DAPA alone have been useful in a variety of applications. DAPA is routinely used as a protease inhibitor during the isolation of proteins that are susceptible to thrombin cleavage. Furthermore, by eliminating the feedback of thrombin activity during prothrombin activation, the isolation of reaction intermediates such as fragment 1.2, and meizothrombin have been made possible (7). DAPA is synthesized according the procedure described by Nesheim, et al. (1). HPLC, TLC and spectral analyses are used to determine the purity of the final product. DAPA is supplied in water. When properly stored at -20°C and protected from light, the compound is stable for many years. A specific and potent thrombin inhibitor (Ki = 10-7M). Exhibits a 3-fold increase in fluorescence intensity and lifetime when bound to thrombin. Nesheim, M.E., et al., Biochemistry, 18, 996 (1979). Nesheim, M.E., et al., J. Biol. Chem., 254, 10952 (1979). Hibbard, L.S., et al., Biochemistry, 21, 2285 (1982). Nesheim, M.E. and Mann, K.G., J. Biol. Chem., 258, 5386 (1983). Krishnaswamy, S., et al., J. Biol. Chem., 261, 8977 (1986). Krishnaswamy, S., et al., J. Biol. Chem., 262, 3291 (1987). Doyle, M.F. and Mann, K.G., J. Biol. Chem., 265, 10693 (1990). Bos, M., et al., Blood. 2009 114: 686-692. Majumder, R., et al., Blood. 2008 112: 2795-2802. This publication list is not all encompassing, and is only meant to provide limited examples of how Haematologic Technologies' products are used. We encourage you to search the literature for other examples pertinent to your experimentation, and to contact us with any technical questions.